The largest and most spacious civil helicopter manufactured by Bell. The Bell 525 Relentless is part of the latest generation of helicopters and features superior performance and reach, coupled with much safer operation as a result of two powerful GE CT7-2F1 engines and advanced features such as the fly-by-wire system. All this added to a spacious cabin that can be easily configured to carry many passengers or large volumes. To say that the 525 Relentless is a great aircraft is not just a figure of speech. 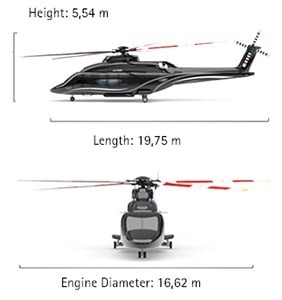 It is simply Bell's largest helicopter, capable of carrying up to 16 passengers and 2 crew members or accommodating a large volume of cargo, serving the most diverse of missions. The aircraft is known for its superior performance and low fuel consumption. Its CT7-2F1 engines are part of a new generation of engines, and it is already the number one choice for all offshore operations. The Bell 525 Relentless is the first commercial helicopter to incorporate Garmin G5000H avionics. It is the most advanced technology available for the segment and includes features such as touch screen, 3D terrain map view, among other functions that reduce the pilot's workload and raise the level of situational awareness. It is also Bell's first civilian model equipped with the fly-by-wire system, which makes the operation of the helicopter much safer. The Bell 525 Relentless is also impressive due to its strong and imposing appearance, the trademarks of this super-machine. Its interior space is as vast as the configuration options available for this giant, being able to meet the most varied needs. 2 19,000 lb, Sea Level, ISA+20°C.